two points for honesty: DIY rosette necklaces...I'm in l-o-v-e! DIY rosette necklaces...I'm in l-o-v-e! Have I mentioned I LOVE fabric rosettes lately? Have I further mentioned I've been somewhat of a crafting FREAK lately? And did I say I found a sweet video tutorial on how to make said fabric rosettes? Well, I think what I did this weekend goes without saying. Scissors, glue, paper, mod podge and fabric have taken over my dining room. I'm okay with it. Fold the fabric in half, then in half again. 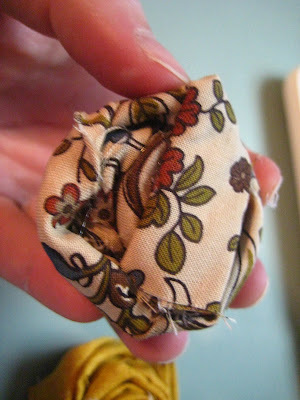 Start rolling the fabric, putting a dab of hot glue every 3-4 rolls. Once you get a good size "roll", start folding the fabric down to the left as you continue to roll it and wrap it around the center, and glue down every 3-4 rolls/folds. Once your flower is the size you want, (snip extra fabric if you need to) and glue the remaining fabric onto the bottom of the flower. Glue the flower onto a circle of felt (not pictured). Glue all of the felt circles into a bigger piece of felt in the order/design you want them. Trim around the felt so you can't see it from the front. Glue two pieces of ribbon onto the tops of the felt so it can be tied around your neck. I made another one on this pearl chain, where the two flowers can be interchanged. The plan is to sew the two circle hook thingys onto the top of each flower, so it can easily slide on and off the necklace.